Who is your mother? Can you define her? Who was she before she was your mother? Before she was anyone's mother? And who are you in relation to her? Adriana Paramo's honest and searing look at her mother and their relationship in the wake of mother Carmen's death in her memoir, My Mother's Funeral, is a beautifully written portrait of a mother, a daughter, and their life together in Colombia. Told non-linearly, Paramo recounts the story of her mother as a young woman, the woman who is captivated by and marries the suave and smooth-talking Mr. B, but also the mother who is bowed but not broken by mothering six children while enduring poverty and a mostly absent, philandering husband who contributes nothing to the household but another mouth to feed each time he comes home to visit. 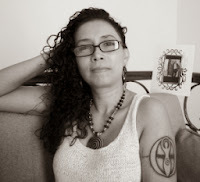 In addition to her mother's story, Paramo also tells her own story, that of the last of six children who always knew that she was loved no matter how difficult another child would make life, how she was raised and taught to value herself, how she left Colombia to pursue another life, and ultimately how she faced the crushing loss of her mother. And each of these parts of the whole weave around and through each other as Paramo writes so that they are all part of the same story. In writing her memoir thusly, she honors the mother daughter bond they shared, keeping it alive, cherishing it in all of its imperfection. As she writes the details of her mother's life, Paramo draws a picture of Colombia, its poor, its criminal, its warring parties, and the fight to stay above it all. Her mother's struggles are many but she is determined to turn her daughters into worthy women. She is practical, often making do with meager food, pushing the girls to get an education (even helping one of her daughters render down a body into a skeleton for a science class), and holding them to standards she herself maintains no matter how poor they are. Paramo's depiction of her family's everyday life in Colombia can be startling, as in the case of the skeleton, but it is also a lesson in perseverance and resilience. And she has captured the ordinariness of life, the innocence of a child living that life. But Paramo has also opened herself fully to the reader, exposing the scope of her grief at her mother's death, her guilt over leaving Colombia for Alaska, and her devastating sense of loss for the connection between she and her mother when she writes so viscerally of her emotions during the brief time encompassing her mother's wake, funeral, cremation, and the disposal of her worldly possessions. My Mother's Funeral is a magnificent weaving, beautifully written, meditative, and messy with truth. This is no nostalgic and saccharine tale of mothers and daughters but a gritty and realistic look at the ties between our hearts, those that tug and chafe but also those that enfold. It is a history of one mother and daughter, a glimpse into Colombia then and now, and a stunning, difficult love story. 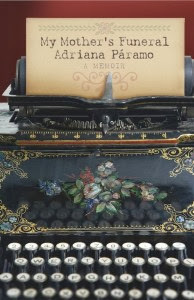 For more information about Adriana Paramo and the book, check out her website or her Facebook page. Follow the rest of the blog tour or look at the amazon reviews for others' thoughts and opinions on the book. Thank you for reviewing My Mother's Funeral and for treating my work with such respect and tenderness. Wow, it looks like this is a powerful book that is not to be missed! Thanks for the fantastic review for the tour. I'm featuring your review on TLC's Facebook page today.